How would do you adjudicate an unhallow spell when is has a silence spell added to it and the caster chooses to make evil creatures immune? My guess was that creatures save once when entering, and that the spell goes away when they leave, but they need to save again when they enter again. I also guessed that it would be a modified silence in that it would not have a 20-foot radius. Any way you adjudicate it, it appears to call for some slight twist of the rules. Just how does the silence spell act? Do objects keyed creatures drop make sound? If a character fails the save and becomes silenced, can he or she stand next to a foe, or within 20 feet, and then silence them? The spell description lays out the answers to most of these questions pretty well, and we can use that as a jumping off point to answer the rest. The unhallow caster has the option to affix another spell to the unhallowed site. In this case, the “site” is the unhallow spell’s 40-foot radius emanation. Anything entering the unhallow emanation is subjected to the affixed spell. Adjudicate that according to how the affixed spell works when cast on its own. If the affixed spell has an area, substitute the unhallowed area for the affixed spell’s area. Use the affixed spell’s area effects. In the case of a silence spell, the entire unhallow area would become cloaked in silence. Creatures would not receive a saving throw against silence effect when entering the area (because silence does not allow a save when cast on an area, only when the caster tries to make a creature the center of the spell’s emanation). Nor do they pick up mobile silence effects that move with them. If the unhallowed caster chooses to exempt creatures of the same alignment or faith, those creatures ignore the silence effect. They can hear, make noise (even when dropping objects), and converse. Other creatures that are not exempt from the silence remain silent (even when dropping things); they do not make any noise that anyone can hear (even exempt creatures), nor can they hear the sounds exempt creatures make. Can the Weapon Focus feat ever apply to spells? If so, what spells? If you use the spell as a weapon, you can use Weapon Focus or any other feat that affects weapon attacks with it. You use the spell as a weapon when you make an attack roll with the spell and the spell deals damage when you hit. In this case, “damage” includes normal (lethal) damage, nonlethal damage, ability damage, ability drain, and energy drain. You can treat certain classes of spells a single weapon type. These certainly include ray spells (that is, effect spells with the ray entry), touch spells (spells with touch range and a target entry of creature [or object] touched), and energy missiles (any spell with an energy descriptor and effect entry whose effect is an energy discharge that you hurl or otherwise direct with a ranged or melee attack, such as produce flame or acid arrow.) Other classes of weapon spells are possible. Keep in mind that weapon spell still works like a spell. It interacts with special qualities such as damage reduction, energy resistance, and spell resistance the way a spell does. • Take your time and allow yourself a Mulligan (or two). Players often will press for a fast answer that favors them (or that “just happen” to favor them). Don’t give in. When you must make a ruling during a game, you’ll most likely want to decide quickly just to keep things moving, and that’s fine. Nevertheless, take a moment to consider your options, and always explain to your players that you’re making a ruling now so the game can continue, but that things might change once you have some time to think things over. If you later decide to change your mind, communicate the change to your players as soon as you’re able and explain things carefully. • Start on firm ground. When considering a ruling, look for a rule or a situation where you confident about the answer, and try to extrapolate from there. For example, in our earlier discussion of the unhallow and silence spells, I began with the two spell descriptions. I considered how a silence spell would work when not associated with an unhallow spell and worked from there. • Think about how the situation would play out in the game world. Remember that the game represents heroic action on a world where magic works. In the case of the Weapon Focus question, I thought about what characters in the game do with weapons and how a spell might work in a similar way. Some spells simply go where you aim them (magic missile, for example). These spells aren’t much like weapons. Other spell require you to strike at foes and take a chance at missing (such as flame blade and acid arrow), and those seem quite a bit like weapons. 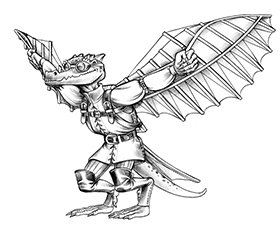 Ask the Kobold is a free service of the Kobold Quarterly site, but we need your questions to keep going! Ask in the comments. Wasn’t there a famous module featuring a cult of a frog? Wasn’t there a case of the Unhallowed with Silence added in the Tsoscanth (sp?) module way back when? I believe that there was an Uhallow with Silence at the end of Red Hand of Doom as well. It’s interesting, because silence CAN be cast either on an area or on a person…and some of the unhallow spells can also be cast on people (doom for example). I wonder if the caster of the unhallow could make the choice for the silence to be area based or creature based? Course, even if he could, as a design issue, I agree with the sage that it gets far less “sticky” if we use the area version. It’d be interesting to switch the alignments as well…like evil creatures are silent in a church of Mask but all others can be heard as normal. Yes, the temple (and cult) of the frog go back to Arneson’s Blackmoor, IIRC. There was an expert module (DA2: Temple of the Frog) which came out in 1986. 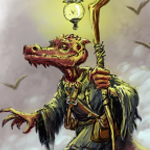 I don’t know how it relates to “Ask the Kobold” – I don’t remember anything related to unhallow or silence. I think Wolfgang has said that “Temple of the Frog” was a placeholder on the TSR release schedule in the 90s, but I might have that wrong. Yep, they do date back to Blackmoor. This particular heraldic device predates even Arneson, though. “Return to the Temple of the Frog” or just “Temple of the Frog” often appeared on the release list in the 90s. It was always removed before the catalog was actually created, but someday I’d like to actually write it. Seems like it is a perfect premise. Maybe with a Tsathoggua twist, maybe straight-up frog cult lizardmen. UPDATE TO ADD: Of course, Edward Albert did publish a title under the “Return to…” name. It’s short enough and had small enough distribution that I think there’s still lots of room there. 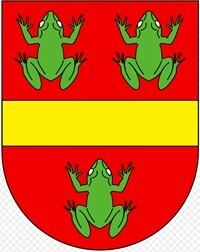 The shield is the traditional heraldic device for Satan, I believe, although personally I think the frogs aren’t imposing enough for the Prince of Darkness. I’d love to see straight-up frog cult lizardmen, not least because I always thought lizardmen were under-used and under-described. A society of reptiles would be really alien, and there’s lots of potential for fun using other oddities of reptilian biology. Cool idea. Wizards 3.5 archive has Return to the Temple of the Frog as an updated adventure, and the history of the module differs from what Wolfgang says. It’s not that confusing, I hope; we’re addressing different elements. I’m talking about the “Return to the Temple of the Frog” that was part of a TSR in-house joke. You’re talking about an RPGA adventure by Edward Albert, which I reviewed before publication. They’re…. tangentially-related, at best. The TSR story predates Albert’s work by 15 years or so. But yeah, he beat me to the punch. HOLY COW! Therabyd actually got it right! Bravo! It was so obscure I stopped checking the comments thread….